We have gathered together stories and photographs which illustrate life down the years at Grantham Yard signal box. There are reports from the local newspaper The Grantham Journal (which continues in publication today) and we’ve searched far and wide for photographs. Most importantly, people who worked on the railway at Grantham have kindly shared their personal recollections of the job and of the people they worked with. We are presenting what we have in chronological order. Material is still coming to light and we will slot new items in as they are discovered. 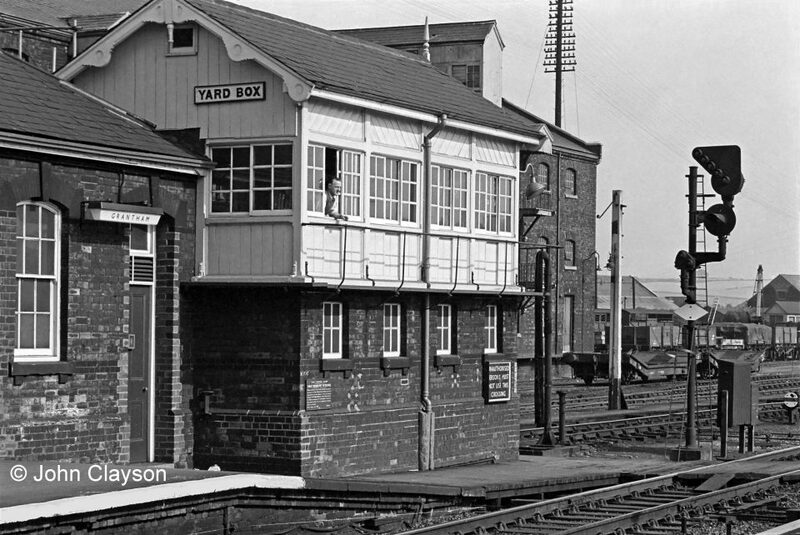 If you have anything which adds to the story of the Yard Box at Grantham please let us know. A lightning strike during a violent summer thunderstorm damaged a signal post near the Yard Box. At 12.44am a Manchester to London passenger, mail and perishables train stopped as scheduled in the Up Main line platform at Grantham station. A few minutes later it started off for the south past the Yard Box. After a few yards it collided, almost head-on, with a goods locomotive which was bringing wagons out of the goods yard across the Up Main line at the south end of the passenger station. The accident occurred at at low speed and there was no derailment, but nine persons were slightly injured. Both locomotives and several items of rolling stock were damaged. The site of the collision is shown on the following map. This diagram shows how the two trains collided. The Manchester to London train (yellow arrow) left the station. The goods locomotve (blue arrow) was hauling wagons from No.2 siding to the Down Main line, where it had left its train (also blue) while it collected the wagons from Grantham goods yard. At work in the Yard Box was experienced signalman James Herring. His signals for the Manchester train were at danger while he was setting the road for the goods locomotive to move forward out of the siding. When he heard the locomotive of the Manchester train whistle and saw it begin to get under way he showed a red lamp and shouted to the crew as they passed his box. The Board of Trade enquiry heard that the driver of the Manchester train was oiling his locomotive on the side away from the platform when his fireman received the guard's signal to start. He informed his driver, who gave the fireman permission to get under way as he climbed up onto the footplate. However, neither of them checked the signal at the end of the platform. They saw signalman Herring's lamp and heard his shouted warning, but it was too late to avoid the collision. Here is a link to the Board of Trade accident report. At the time of the accident James Herring of St Ann Street, Grantham had been a signalman at Grantham for more than 31 years. He was still in post in 1901. This was the night of the high speed accident at the north end of the station, described in the equivalent page relating to Grantham North box. A northbound overnight mail train which was scheduled to stop at the station ran through at high speed and was disastrously derailed at the junction just beyond Grantham North. When the train passed my box I thought it was going at a terrible rate - I should say 50 miles an hour. I at once gave the 'train on line' signal, but by that time the engine was past me. The speed of the train appeared to me to be nearly the same as that of a train which was running through without stopping at Grantham. Isaac Crowson had been a signalman on the Great Northern Railway for 31 years, with nearly 22 years at Grantham Yard Box. 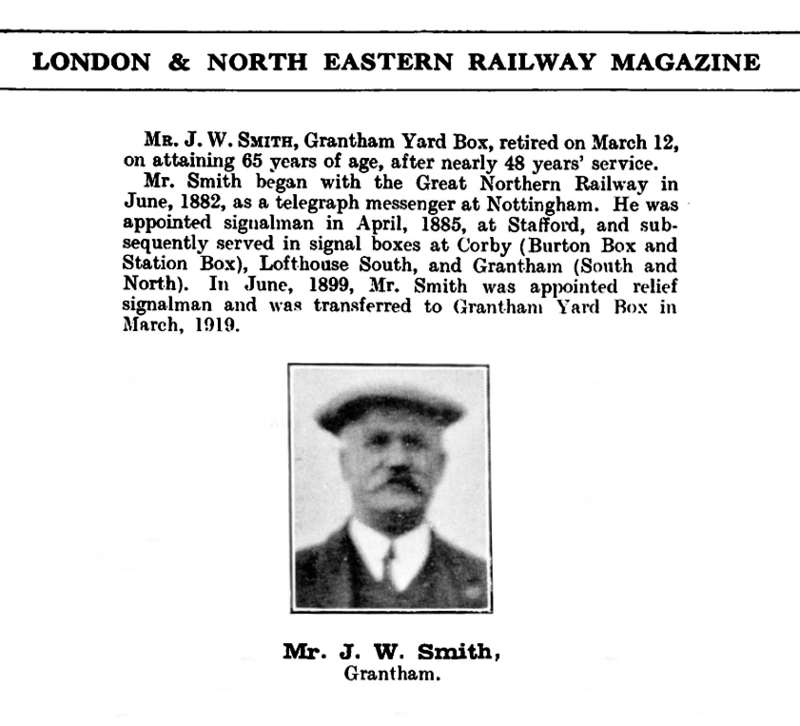 Joseph William Smith and Walter Piggott, two signalmen who commenced work on the railway in the 1880s, retired from the railway service at the Yard Box in March and April 1930. From The LNER Magazine July 1930, page 378, with acknowledgement to the LNER as publisher and with kind permission from the Great Eastern Railway Society. The Society has funded and organised the magazine’s digitisation. The digital copy is highly recommended and can be ordered as a 2-DVD set here. From The LNER Magazine June 1930, page 322, with acknowledgement to the LNER as publisher and with kind permission from the Great Eastern Railway Society. The Society has funded and organised the magazine’s digitisation. The digital copy is highly recommended and can be ordered as a 2-DVD set here. 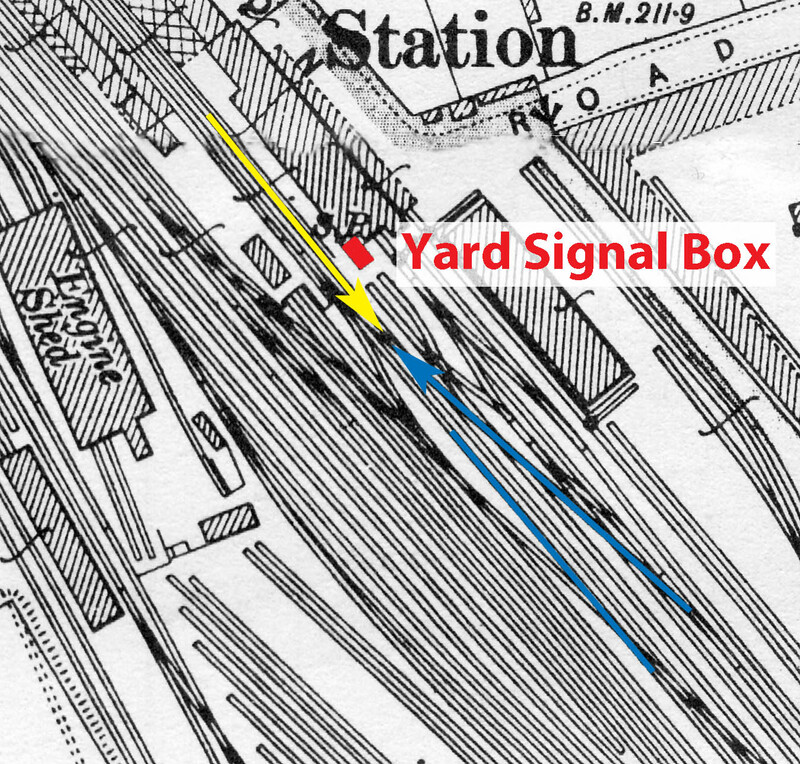 The signalmen at the Yard Box were paid £3 5s per week. By comparison, a signalman’s pay at Grantham North Box was £3 15s, at Grantham South Box £3 10s, and at Barrowby Road £2 15s. Early in 1963 Grantham station and associated buildings were given a fresh coat of paint. The dark green of the steam age was replaced by lighter colours which could be expected to remain clean as steam locomotives were phased out. 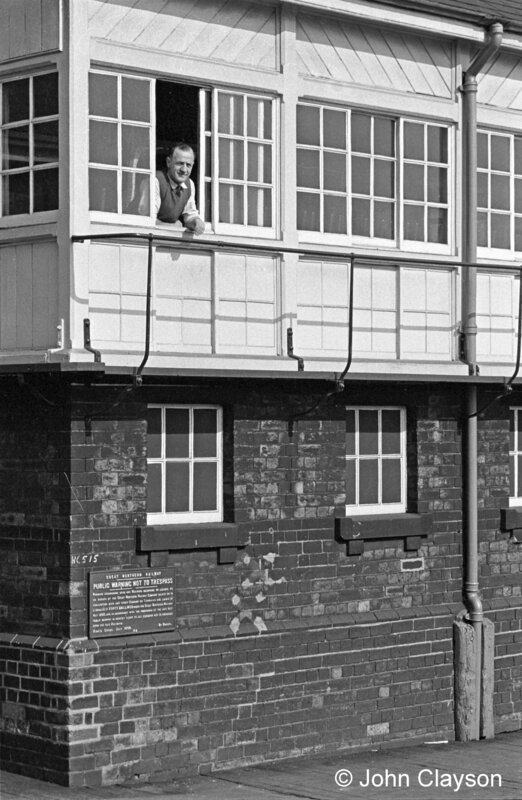 Signalman Jock Drummond is at the window of the Yard Box on 5th September 1963, a fine autumn day. From within you might hear the 'ting' or 'tang' of a block bell, announcing the approach of another train on the main line. What will it be? If you've learned the block signalling bell code you may be able to work it out! 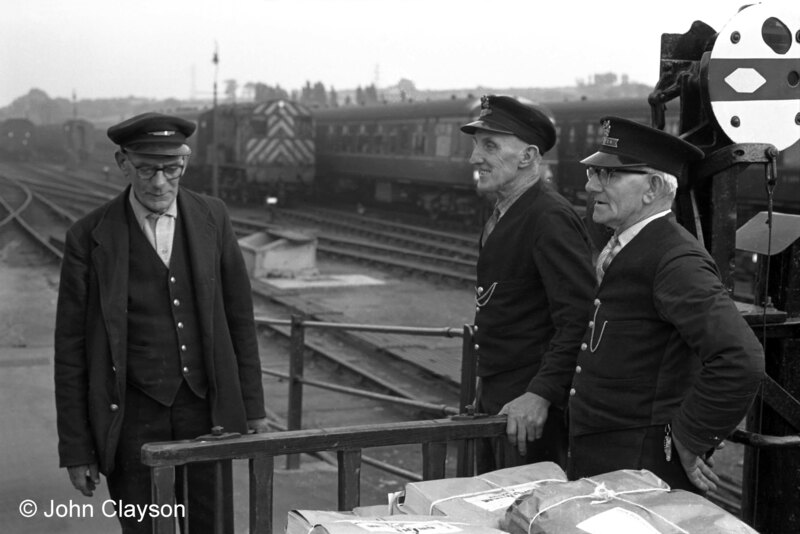 These three porters are at the south end of the down platform opposite the Yard Box, probably waiting for a train to pass before taking the trolley across the main line to the parcels office. The disc signal on the right enables the Yard Box signalman to control shunting movements out of the down main line platform. The porters are, left to right, Alf Woodward, Mr White and Bob Carpenter. Photograph taken on 27th June 1963 by Cedric A. Clayson. 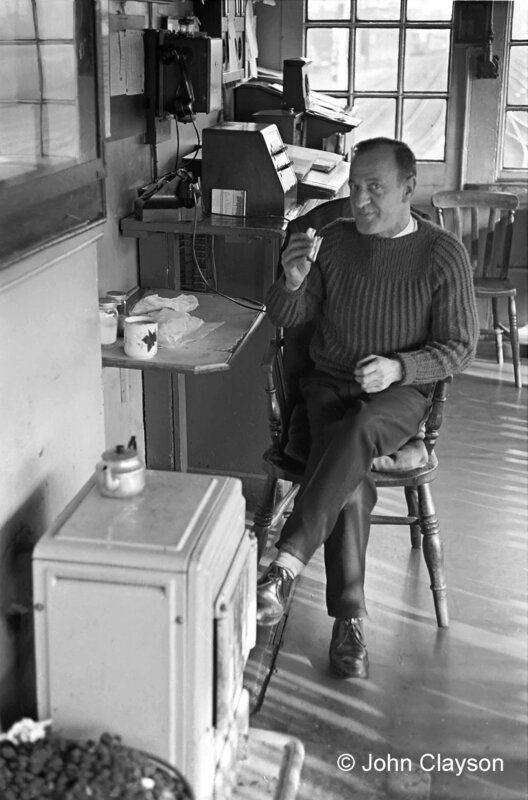 The signalman whose 'afternoon tea' we've interrupted is Jock Drummond. The lever frame is out of shot on the right – the shadows of the levers can be seen across the floor. Photograph taken on 16th April 1964 by Cedric A. Clayson. In the foreground is a coke-burning stove. Beyond the signalman is a wall-mounted telephone for voice communication with other signal boxes, with drivers calling from telephones at signals, with the station announcer and, most importantly, with ‘Control’. Control was the nerve centre of an area of the railway, from where the whole business of operating the line was managed and co-ordinated. Messages about late running trains, breakdowns and other occurrences were passed to, and received from, Control. It normally had one handset. There were switches you see on the front, along with an indication lamp associated with each switch. The switches allowed the signaller to connect to incoming calls if the respective switch was placed in one position, and make outgoing calls if it was in another. This arrangement allowed for most telephone lines to be concentrated on one piece of equipment instead of having numerous telephone instruments. Beyond the telephone is the sloping-topped train register desk. All activity in the signal box was logged carefully in the train register - an essential record in the event of an incident. Further on, with a sloping support for a notepad, is a single-needle 'speaking' telegraph instrument. This system was an earlier means of communication than the telephone between the signal boxes in the immediate area. For example, it enabled signalmen to monitor the progress of express trains so that decisions could be made locally on holding freight trains in loops or sidings. The ‘ting tong’ of its needle was sometimes quite continuous because every message on the circuit was relayed to each instrument (an 'omnibus' system), although each signal box had its unique call sign. Ray Phillips, an EWS driver in 2008 who started his railway career as a Telegraph Lad at Grantham, told me that in his day the circuit from Retford to Grantham used the single-needle telegraph, but from Grantham southward to Peterborough the telephone was in use. He recalled that the call signs were as follows: Grantham North: AB; Yard Box: GJ; South Box: GX, and Stoke SK. …these single-needle instruments survived in intensive use right into the early 1970s. They were popular with signalmen as there was no need to pick a phone up to take a message, and indeed it was possible to hear messages intended for others and get a picture of how trains were running. With this information, signalmen were able to regulate traffic accurately without any need for Control intervention.